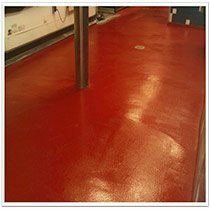 Industrial Flooring - All Concrete Resurfacing Sundek in Louisville KY – Concrete Coatings and Decoration. Learn about our process All Concrete Resurfacing has provided superior results to our industrial customers for over three decades. Our unparalleled knowledge and experience allow us to provide the ideal flooring solution possible for our customers’ specific needs. All Concrete Resurfacing has over 30 years of experience in the flooring industry. We can provide expert coaching on selecting the best coating system for the industrial customer’s needs. We can provide a wide range of solutions, from chemical to thermo shock resistance, to high traffic, or for extreme abrasion abuse. All Concrete Resurfacing has a qualified staff on all major coating brands. We can provide support that will protect, enhance, or meet compliance code for manufacturing and assembly plants, distribution centers, warehouses, schools, hospitals, automotive, aviation, pharmaceutical, food and beverage, institutional and retail centers.